The Extreme delivers hot water in about 10 minutes. Simply fill with water and place on the gas burner. When the built in temperature strip shows 100 degrees, just pump the handle to pressurize and enjoy a hot 5 minute shower. 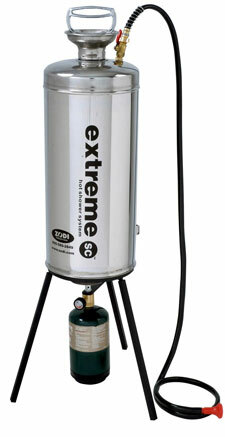 The self contained Extreme SC includes the durable 10,000 btu Extreme Stove. The rugged stove is powder coated for durability and collapses for easy transport. The stove is also handy for cooking and can even handle the weight of a heavy Dutch oven. The Extreme Stove uses a 1 lb disposable propane bottle which is good for about 25 showers. It may also be fitted with an optional bulk adapter hose to connect to a 5 gallon or larger propane bottle.The Zodi Extreme has been the #1 hot shower of choice for back country use for years. Great for camping, hunting canoeing and kayaking.